A great way to save money on food is having breakfast food for lunch or dinner. Eggs, potatoes, and cheese are super affordable. This simple scrambled recipe takes only 10-15 minutes to make and costs under $1 for two people! 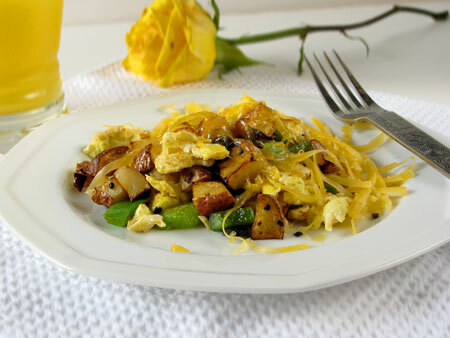 I’m incorporating eggs, cheese, potatoes, bell peppers, and onions into a lot of my recipes this week as we participate in the hunger challenge. They’re very affordable and easy to stretch. Now the food items above have two things in common. First, they’re the only things my stomach feels like it can keep down today. Second, they were not on my shopping list for this week’s hunger challenge. I woke up this morning with horrible nausea and dry heaves. The thought of any other food has sent my stomach rolling in waves that would topple a fishing boat. I was supposed to be eating oatmeal and taco soup for breakfast and lunch, but knew that wasn’t going to happen. 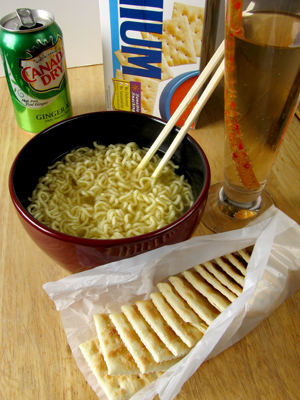 Fortunately I had a few dollars left in my budget of $61, so my wonderful husband spent a half hour of his work budget buying me Saltines and Ginger Ale. It was a good reminder of something else someone on food stamps has to be mindful of. If you spend all your food stamps on the beginning of the week, and suddenly need something else, you could be out of luck. Cut the potatoes into pieces 1/2 an inch or smaller. Add oil to a large skillet and heat on medium high. Add potatoes and stir to coat in the oil. Cook 3-5 minutes until potatoes start to turn golden. Add onion, garlic, and bell pepper. Cook another few minutes until potatoes are easily pierced with a fork. Use a fork to whisk eggs with milk, salt, and pepper (I use a small pinch of kosher salt and two turns of the pepper grinder). Remove potato mix from the pan and pour the eggs in. Cook the eggs on medium high while stirring and flipping with a spatula. When eggs are mostly cooked through add the potato mixture. Stir well until eggs are completely cooked. Serve topped with shredded cheddar. Approximate cost/serving: This whole meal cost 98 cents to make. For the two of us it came out to 49 cents a serving! Pretty cheap lunch huh? Vegetarian/Gluten Free: Although it contains eggs and dairy, there’s no meat and it’s totally gluten free. Breakfast for dinner…we love it! The egg dish looks like a delicious meal to put together during the week. Thanks for sharing Diana. Feel better soon!! Wish I had this RIGHT NOW for lunch! Yum! Hope you’re feeling better soon. I enjoy making breakfast for dinner! A lot of times, I will use leftovers from the fridge to make a frittata. 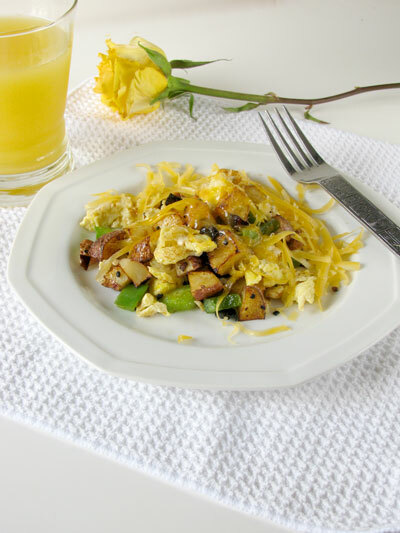 Love your recipe for eggs… Looks spectacular. I really love this recipe, but i prefer it without milk some of my relatives told me that the combination is not good for health.